At a high level, comparing the Nikon D5000 vs. the Canon 500D (also called the T1i) is no easy task. Both cameras capture plenty of megapixels for amateur photographers, both have a video mode and both companies are renowned for their image quality. They are also both small and lightweight, designed to be carried around constantly. Even the price is comparable...so there's no real obvious winner for those who have a fixed budget for a new digital SLR. Let's take a closer look at the Nikon D5000 vs. the Canon 500D to see how these cameras set themselves apart. LCD Size 2.7 in. 3.0 in. The Canon T1i 500D has a 15.1 megapixel sensor, while the D5000 has a 12.3 megapixel sensor. Once megapixel counts get this high (and yes, this is PLENTY for amateur photographers) the difference between 12 and 15 is pretty minimal. All that it means is that Canon 500D photos can be printed slightly larger than those from the D5000. However, it also means that the 500D file sizes are larger - they take up more space on your hard drive and require a more powerful computer to view and edit. If you don't have a speedy Internet connection, uploading to an online gallery will be sluggish. Bottom Line: if you want to make larger prints, the Canon 500D has a slight edge vs. the Nikon D5000. The LCD screen is one of the few areas where these two cameras really stand apart. When comparing the LCDs on the Nikon D5000 vs. the Canon 500D, it's quickly apparent how they differ: the LCD on the Nikon is hinged and flips out from the camera body and rotates, while the Canon 500D LCD is fixed in place. You're able to take pictures from all sorts of odd angles with the Nikon D5000 (ground level, above your head, around corners etc.) and self-portraits are quite easy to compose. When I first started using the D5000, this feature felt like a bit of a gimmick. But now that I'm using the 500D without it, I do find that I miss that twisty LCD. Part of the fun of a live view mode is not always having to hold the camera at eye level. Yes, you can compose images at odd angles with the live view on the Canon 500D — it's just not as extreme as what you can do with the D5000. That's the advantage of the D5000 LCD - but the Canon's got one too. All LCD screens are made up of "dots" — LCDs with more dots display images that are clearer and more colorful than those with less. The Canon T1i 500D LCD has 4x more dots than the D5000 (920,000 vs. 230,000) which makes it quite easy to instantly tell if your subject is in sharp focus or if you need to re-take the image. Bottom Line: if you want a superbly sharp and colorful LCD then the Canon T1i 500D is the better choice, but the Nikon D5000 LCD has the edge when it comes to versatility. In the world of High Definiton (HD) video, there are two standards: 720p and 1080p. 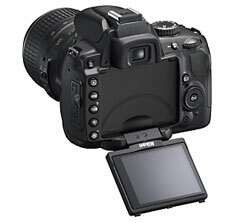 The Canon T1i 500D captures video at both 1080p and 720p while the Nikon D5000 is limited to 720p. While the 1080p option should result in a better picture quality, the difference between 720p and 1080p may be hard for some people to make out. What's not so hard to sort out is the fact that 1080p video generates larger files sizes than 720p. At 720p, you'll burn through approximately 222 MegaBytes/Minute while at 1080p you'll chew through 330 MegaBytes/Minute. A relatively short 5 minute 1080p video will use up about 1.6 GigaBytes...time to start looking for a higher capacity memory card. Aside from the video format itself, another difference between the D5000 vs. the 500D is how the video mode is activated. On the Nikon D5000, you simply press the dedicated live view button to enter live view mode, then press another button to start recording video. With the Canon T1i 500D, you actually have to select the video setting on the main mode dial before you can press a button to start recording. Having this extra step slows down the transition from taking pictures to taking video. One advantage that the Canon has over the Nikon is that you can autofocus while capturing video - however, since the camera's microphone is right next to the lens, you'll pick up the grinding noise of the lens as it focuses. Bottom Line: if you want to quickly transition from stills to video, the Nikon is easier, but if you want full 1080p HD video capture, the Canon T1i is the better choice. Every camera that I have used with a live view mode has been pretty much the same — live view is really only good for taking pictures of non-moving subjects. The problem is speed: in live view mode, the camera's autofocus and shot-to-shot speed slows down considerably. This holds true for both the Canon 500D and the Nikon D5000, so you're not going to see any real difference there. A difference that you can see is how each camera handles autofocus in live view mode. With the Nikon D5000, you always autofocus by pressing down halfway on the camera's shutter release button. This sounds like a subtle difference, and it is — until you get REALLY used to pressing down the shutter release to autofocus. Once you do, you have to keep reminding yourself to push a DIFFERENT button in live view mode. Of the several digital SLR cameras that I've used with live view modes, I much prefer it when the autofocus is only engaged by a single button instead of two. Bottom Line: while performance slows down for both cameras in live view mode, it's easier to engage the autofocus on the Nikon D5000 vs. the Canon 500D. Ergonomics is just another word for "personal preference" — it's all about well the camera fits in your hand. Both the Nikon D5000 and the Canon T1i 500D are small-sized digital SLR cameras. Neither one has a control panel on the top of the camera, which keeps the size down. But the small size of these cameras also translates to the grip: if you've got long fingers or large hands these cameras aren't as easy to hold as some others. Personally I found the grip on the Nikon D5000 more comfortable (the 500D grip feels too narrow), but only YOU can judge which camera will feel better in your hand. Bottom Line: find a store with some floor models and try out each camera - if you like how one "feels" better than the other, than this is the better choice.